Cracks are forming within the Western alliance: but they are not of a political nature. Western European countries are struggling to remain in line with their American ally, and a change in strategy has nothing to do with it: they simply can’t keep up. Financial resources necessary to fund defense efforts are increasingly difficult to find and industrial standards are slipping across the continent. But it is doubtful that all European countries are willing, or even able to fork out more military dollars. 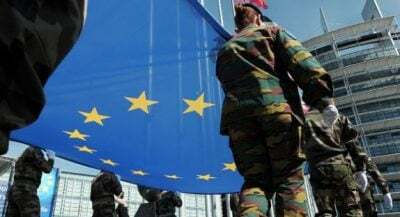 The military gap doesn’t end there, and this situation is not only a question of defense budgets: Europe also lacks some strategic capabilities. The aerial technological shortage is especially visible on the strategic airlift. Due to political tensions and contract mismanagement, Russians will no longer be leasing Antonov-124 to NATO, making the entire logistics burden rest on American capacities, as long as the A400 isn’t fully operational. Even if the new military Airbus were up and running, its payload is still greatly inferior to Russian AN-124 120-ton capacity, making European transport contributions minimal and barely self-sufficient. “Citing the German newspaper Kieler Nachrichten, the WSJ reports that the Baden-Württemberg experienced problems with its radar, electronics and the flameproof coating on its fuel tanks. During its sea trials, the frigate was also found to list slightly to its starboard side”. TKMS was previously seen as one of the best shipbuilding companies in the world. Put simply, neither the UK, nor any European ally, would have the funds to get anywhere near even contributions to the American war effort. And even if unlimited funds were available, the technological know-how would still lack. America has been pounding the table and pushing its allies to step up their game. The election of President Trump has upped the inter-ally rhetoric, as the US no longer wished to bear the brunt of the military defense effort. But even if the American rallying cries for a renewed onslaught are heard, it will probably take years to restore economic levels, quality levels within the industry or to close the technological gap.